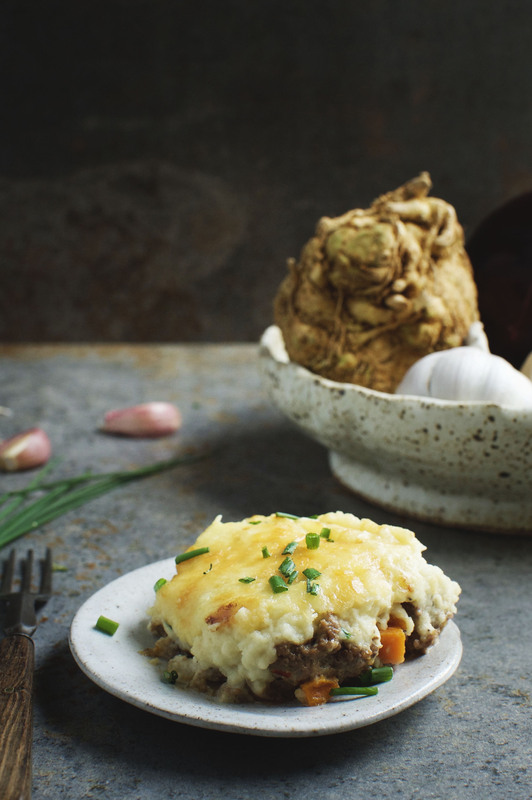 This Low-Carb Creamy Cottage Pie tastes so good you will never guess the recipe is low-carb. This recipe can work for low-carb, ketogenic, LC/HF, Atkins, diabetic, gluten-free, grain-free, and Banting diets. 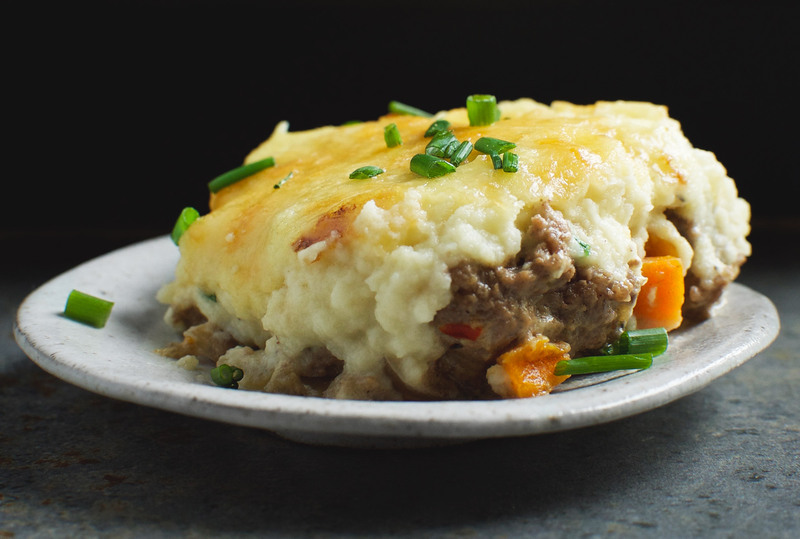 This Low-Carb Creamy Cottage Pie recipe makes an easy, satisfying meal that everyone will love. Imagine a home filled with the comforting aroma of thyme, onions, and melting cheese. These smells are so captivating that they even bring kids of all ages out of their rooms and to the table without complaint. This is a meal that tastes and smells like you’ve spent hours in the kitchen. You don’t need to tell anyone that the food processor did the heavy lifting and it was a breeze to make. 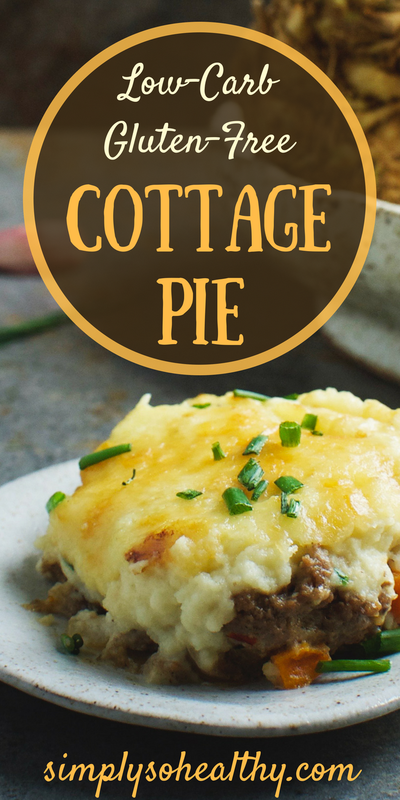 This Low-Carb Creamy Cottage Pie recipe makes warm, comforting meal that’s perfect for fall and winter. It’s easy enough for a weekday dinner, but inviting enough to serve to company. This dish has a filling of tender ground beef and onions in a creamy sauce scented with garlic, thyme, and a hint of red pepper flakes. The topping makes this dinner really special. The topping is creamy goodness, laced with cheddar cheese, sour cream, garlic, and a bit of thyme. Everyone will think that the topping is mashed potatoes, but it’s not. Instead, it’s made from mashed celeriac. Celeriac, or celery root stands in as a dead ringer for the mashed potatoes in traditional cottage pie. Celeriac is a weird looking vegetable that reminds me a bit of the mandrakes in the Harry Potter movie. Once a celeriac is peeled, it looks pretty similar to a big potato. Once steamed, it even tastes like a potato, but has a slight, pleasant celery flavor that reminds me of my mother’s stuffing. 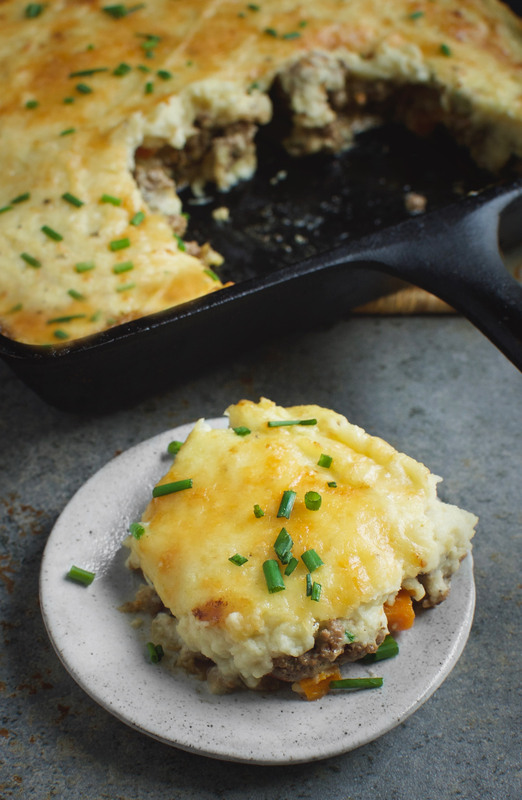 This Low-Carb Creamy Cottage Pie is a recipe that the whole family will love, whether low-carb, or not. It can be assembled ahead and kept in the refrigerator overnight, covered.When you’re ready for a quick meal, just bring to room temperature, then bake as directed. Enjoy! Preheat oven to 375º Fahrenheit. Prepare a 9 X 9 inch baking pan by greasing with butter or coconut oil. Place celeriac in a large saucepan. Add about 1/2 teaspoon salt (reserving the other 1/2 teaspoon). Cover celeriac with cold water. Cover saucepan tightly and put over high heat. Bring to a boil, then turn heat to low. Simmer until celeriac is tender--about 10 minutes. While celeriac is cooking, place garlic, butter, thyme, 1/2 teaspoon salt, pepper, 1 cup of cheese (reserving 1/4 cup), and sour cream in a food processor. When celeriac is tender, drain and discard the cooking water. Add celeriac to the other ingredients in the food processor. Pulse until creamy. Taste and adjust seasoning. Heat a large skillet over medium-high heat. * When hot, add ground beef. Season lightly with salt and pepper. Cook beef, stirring occasionally until all sides begin to brown. Using a slotted spoon, remove beef to a plate. Discard all but 1 tablespoon of the grease from the pan. Place skillet over medium heat. Add onion and carrots to the skillet. Cook, stirring occasionally carrot is tender and onion is beginning to brown on the edges and appears translucent. Stir in garlic. Cook one minute. Add vinegar. cook, scraping up browned bits, until vinegar has almost completely evaporated. Stir in thyme, sour cream and heavy cream. Allow to simmer until thickened. Stir in 1 tablespoon chives (reserving 1 tablespoon for later). Add the cooked ground beef to the mixture and stir to combine. Spoon the ground beef mixture into the prepared pan. Spread the celeriac mixture on top. Sprinkle with the remaining 1/4 cup cheese. Bake in preheated oven for 30-40 minutes or until bubbly in the middle and top has started to brown. Remove from oven and allow to cool 10-15 minutes before serving. Sprinkle reserved 1 tablespoon chives over the top before serving. *If using low-fat beef, you may need to use a non-stick skillet or melt a tablespoon of butter in the pan to prevent sticking. I don’t think we have celeriac at our store so can I use cauliflower instead? Absolutely! Cauliflower would make an ideal substitute. Do you think this would freeze well? Would be nice to make it and freeze in portions for lunches. Freezing in portions sounds like a great idea! I don’t know why it wouldn’t work. The only issue I would be concerned about would be some separation of the filling, but this may not be a problem. Let me know how it works! 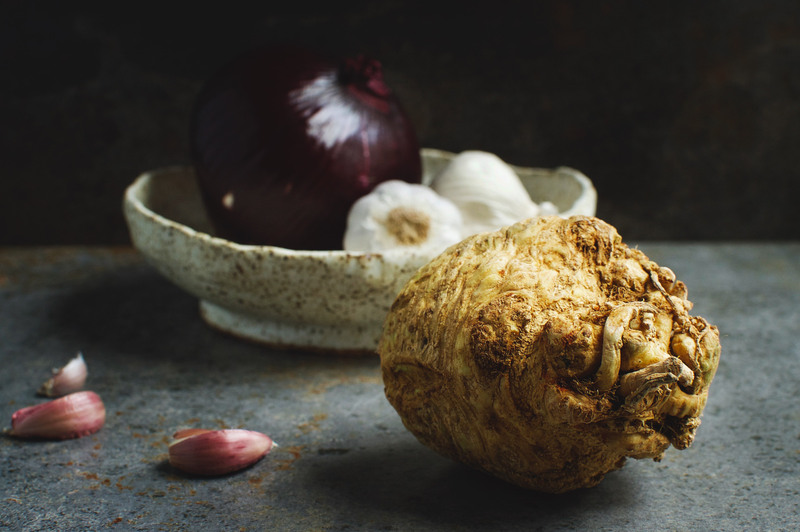 Does celeriac have a strong flavour? I wouldn’t describe the flavor as strong. It has a light celery-like flavor. I made this with ground chicken and it was lovely. Having again tonight. I think I may add some mushrooms as well. Thank you for the recipe. Thanks so much! Mushrooms would be great with it! 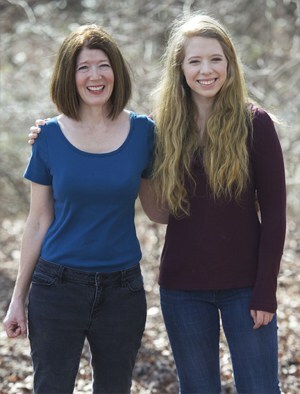 My family loves this. I use an immersion blender and blend everything right in the pot. I also use cauliflower for the topping and it works well. As someone who has some cooking experience I was able to follow the recipe no problem. For newbie cooks it might confuse that there are some missing steps. For example there isn’t anything about stirring the meat back into the sauce to combine it. Using an immersion blender is a great idea! Thanks for letting me know about the missing step. Sometimes I miss something when I write up a recipe. I’ll add it so I don’t confuse anyone. 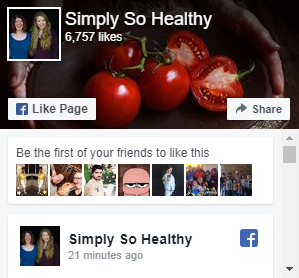 I’m glad you enjoyed the recipe! How would I replace the heavy cream and the sour cream? You may want to look for a different recipe. I don’t like to make too many substitution suggestions unless I’ve tried them before. Good luck!